Yep @Hawaiibadboy, you helped a lot of people jump into the hobby with your honest reviews. Regarding the Fearless Audio IEMs, man, these look dope! Do I need them? No. Did I ever think that I'd spend hundredths of € on IEMs? Definitely not! Can I buy them? Yes, I have some spare money, it won't affect my ability to pay food/bills/loan/Friday Night Magic. Should I buy them? Well that's a tricky one. Should one buy happiness? Hmmm, if happiness could eventually be bought, I'd guess so... One can certainly offer toys to a child to bring happiness. Wait... Should one theach his kids that happiness comes from toys?! Will this IEMs genuinely make me happy or is it yet another need for spend moment? Damn this consumption society (yes, it's easier to blame it on the society rather than to blame it on myself). Am I considering this as a toy? Joker. Will I get them? I shall wait for a couple of weeks/months to wisely consider the question. Custom or uni? Wow I had no idea such a thing as custom could exist, is it worth it? FunctionalDoc and Hawaiibadboy like this. Redcarmoose, jsmiller58, warriorpoet and 1 other person like this. Hey , can you do me a "big" favor ? When u graph the ACME could u graph the Legend X too? would be very nice to compare the 2. Specifically, w.r.t custom, I'm also likely getting custom. (Just need to finalize on S8F vs S8Pro). Please note that the reshelling costs would be around 150 USD, so accordingly if you plan to sell them later, there will be a drop in price relative to universal. @Hawaiibadboy - what are the sonic differences between s8f and ex800st? Been a while since I rocked the 800ST (loved em so they got re-cabled 4 years ago ). I prefer the S8F but the 800 is a legend and the big brother EX1000 is a king. So, the more I listen to my S6 the more I think that I really don't like 2 pin connections and wish mmcx was just standard. Comparatively they're just too delicate compared to mmcx if you make adjustments in your ear at all. Aftermarket cables are also much more of a mixed bag for fit. The only positive is the ease of switching cables, which I rarely do. In terms of sound, my impressions are really starting to settle in with the S6. They're an energetic set with good dynamic range. Even EQd they have a very forward lower-upper-mid presence (4k ish). Vocals simply don't have quite the smoothness of the CL2 (ie. Leave the war with me by London grammar) but the subbass presence is greater. They're more forgiving than my CL2 and more revealing than the it04. They sound a lot more lively than the it04 (DWI by missio and sorry by nothing but thieves) while those are more laid back and smoother. These are still hard to listen to empire of the sun on (ie. Celebrate, from Ice on the dune), but not as bad as the CL2. Overall, pretty good, they're getting a lot of ear time over more expensive pairs. Staging, laying and separation is possible one area for improvement. There's nothing special about this pair IMO, and when things get really busy, they can sound a bit congested (news from Verona by portico quartet). 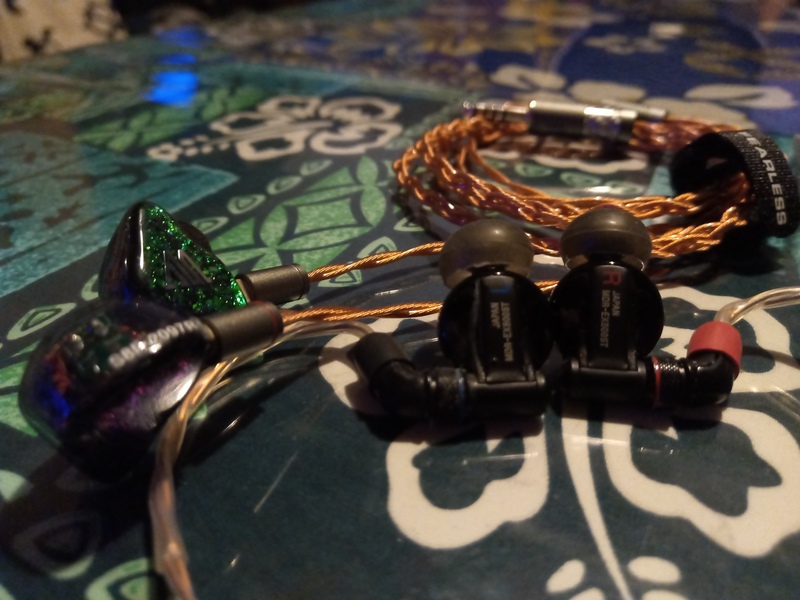 IEM: RHA CL2, fearless S8F, fearless s6rui (sold), CA Andromeda (sold), ibasso it04, audeze isine20 (sold), ibasso it01 (sold), tfz king pro, brainwavz b400 (sold), kz zs10, kz zsr, tfz E5, tfz s5, nuforce EDC, tfz tequila (for sale), ety er4p. Full size: hifiman he4xx (on the way), Lola, rbh hp2, oppo pm-3 (sold), ultrasone hfi780, AKG 501 k.
Currently for sale: ibasso it04, tfz tequila. geagle, manukmanohar and Carlsan like this. Staging, laying and separation is possible one area for improvement. There's nothing special about this pair IMO, and when things get really busy, they can sound a bit congested (news from Verona by portico quartet). I wonder if this would be better refined on the S8F? Perhaps @Hawaiibadboy can find a complex track and do a comparison? Thanks for your impressions btw. I am in and on the S8F train and this sounds special. Not going to ever get into a question about what another man hears. My library is mostly Rock. Some Hip Hop and a touch of Reggae. Yet, it seems to be quite expensive. what do you think about the price of custom S8F with ear expression? You were so close to comparing the s8f to the ex1k, then....just a tease! I think EX1000 are the finest DD ever. Nothing has a stage like it. Bass and mids are like clay to be molded. I have O.C.D so micro details are big for me. Both do that about the same. I was not even a fan of BA sets until about a year ago. I can do a vid after stuff tins out. cocolinho, hemipowered007 and warriorpoet like this. sciOC: I've been listening to both 2 pin and mmcx for quite a while, and I have to agree with you about 2 pin being problematic. I should note that if the iem has a recessed entry and the cable has that notch that fits into it, I've had no problems. I'm a big fan of the Oxygen in everything but long-term comfort, and maybe insertion depth/ isolation. For me, they're my favorite DD. Curious to hear your thoughts.